In this month of November when we remember those who have died, we also meditate on why we pray for the Holy Souls in Purgatory. Purgatory is the place where every spiritual defect is corrected. It is also where we pay for all the bad actions confessed, but not made up for while living here in this world. In Rome there is a room that is filled with scientific evidence of Purgatory. Go see for yourself and believe. It can be found (a long (but possible) walk from St. Peter’s Basilica) just east of the Palazzo di Guiustizia (Palace of Justice. The church is along the Tiber River and is called “Chiesa del Sacro Cuore del Suffragio” or in English, the “Church of the Sacred Heart of Suffrage”. The church is one of the very few neo-Gothic churches in Rome and was finished in 1917. It’s official name is “Sacro Cuore de Gesu in Prati”. On this site was originally a chapel dedicated to Our Lady of the Rosary. On September 15, 1897, a fire destroyed this chapel. On one of the charred walls was a definite and clear image of a suffering face of a soul in Purgatory. The priest there, Fr. Victor Jouet was so impressed with the image that he believed it to be a miracle. So with the support of Pope Pius X, he traveled through out Italy, Germany, Belgium and France to find relics that prove the existence of Purgatory. Fr Jouet put these items in a room adjacent to the Church and is called the Piccolo Museo del Purgatorio. If you wish to see it, you have to go when the church is open. It is open Monday through Friday 7:30 to 11 and 4 to 7. As far as I know it is closed for lunch from 11 to 4:00. There daily Masses are 7:30, 10 am and 7 pm. Sunday’s masses are 8, 10:30, 12, and 7pm. Usually the museum is open when the church is open for Masses. For 11 nights, Joseph Leleux, in Belgium, had been awakened by frightening noises. On the 12th night, June 21, 1789, his mother Mrs. Leleux appeared to him and burned her hand mark on his night shirt. She also reproached him for his way of life and implored him to practice his Catholic faith. He was converted and started a pious congregation for the laity. You can see this bed shirt in the museum. 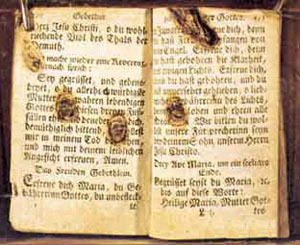 Another thing contained is the prayer book of George Schitz which bears the fingerprints of his deceased brother Joseph. This happened on December 31, 1838 in Lorraine, France. 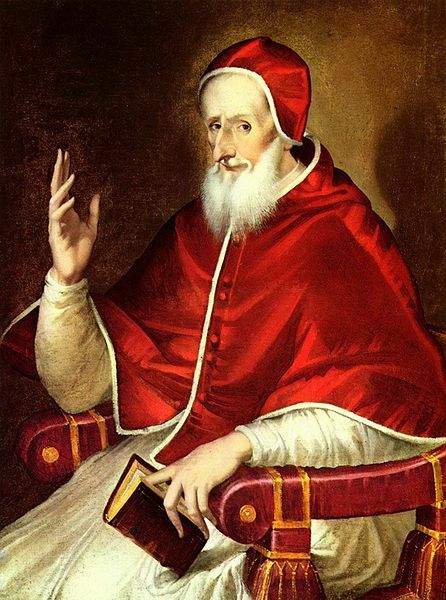 He asked for prayers because he was making expiation in Purgatory for his lack of holiness before he died. The mother in law of Margherite Demmerie of the Diocese of Menz, France, appeared to her 30 years after her death. She said “I am your mother in law who died in childbirth 30 years ago. Go on pilgrimage to the Shrine of Our Lady of Mariental and have two Masses said for me there”. 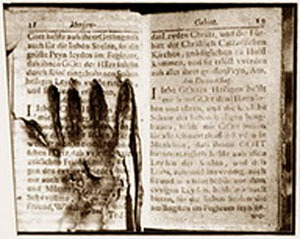 When Margherite asked for a sign, she put her hand on the book, “Imitation of Christ” that she was reading and there were left the burned handprint. After completing the pilgrimage and having the Masses said, the mother-in-law appeared again to tell her that she was released from purgatory. This was all documented by her parish priest. Hard to put this in a more kindly fashion, but this sort of ludicrous, nonsensical, mumbo-jumbo gibberish will not do the cause of Catholicism in the 21st century a great deal of good. Doesn’t it raise the slightest blush? “Scientific Proof?” Of what? – “Proof” that someone – for whatever sordid and absurd motive – has drawn a very crude representation indeed of a “hand,” apparently using a burnt stick – on the page of a book? OK – I will accept that. So..,invidious to name names, I know (so I will) – but I would very much like to hear what my reasonable friends Burro, Raven, Golden, JH, and JonKonn (and anyone else with a dog in this fight) have to say about this rather curious affair. 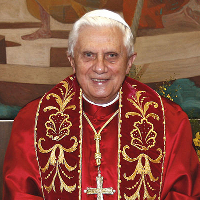 I don’t need to ask you to be truthful – you are Catholics. Goes without saying. But doesn’t it make you just cringe? Toad, we are not aware, as far as I am aware, that any investigations have ever been made into these things. Therefore they could be complete hoaxes or, perhaps, otherwise. How can we make any judgment at all? So we can just let them be. We are not required to believe them. We can remain agnostic towards them. I disagree that people in 21st century will be put off by them. This sort of thing is accepted by people in Asia still. I can show you at least two houses in this country that were vacated by their previous residents and remain unsellable as people believe them to be haunted. The Chinese are particularly susceptible to belief in ghosts, wandering spirits and such. The Muslims here also are more than open to these things and fear greatly being hexed by their enemies. This includes people I have met who are directors of tertiary educational institutions. Let me tell you some time about the feather mysteriously found in someone’s office one day.That means there’s a lot of 21st century people in the world quite open to these things, but they are probably not on Toad’s Xmas card list. I myself have never had experiences of this kind, so I remain sceptical. But people who I know are not bonkers, (for example, a cousin of mine with a university degree and now in her 50s and who is the one of the most level-headed people I know), have. Very nicely and diplomatically – and swiftly – put, GC. For which I thank you. If we can’t, for some reason, make an objective, a priori, judgement about burned “hand marks” from Purgatory, what can we sanely judge? And you do not think it makes The Church look utterly idiotic. If we can’t, for some reason, make an objective, a priori, judgement about burned “hand marks” from Purgatory . . .
Toad, I agree the whole thing sounds very odd, but be our guest. I agree, 100% GC. None of us should not be wasting any more of our time on this patent nonsense. Much more interesting, to my mind, is what the ex-Imam said on the new “thread” (never know what to call each ‘article’). Does the Koran really say Jesus is still alive, meanwhile saying Mohammed is dead? The same as Christians take it to mean? That seems highly doubtful. But I don’t know. Maybe someone does. What a shame. I thought we were going to see a splendid example of Toadian a priori reasoning. See you on the other page about the Qur’an..
Toadian a priori reasoning is no different than anyone else’s. In this case, it concludes that it is not necessary to go to Rome and examine the “scientific evidence” in the Picolo Museo del Purgatorio in order to ascertain that it is totally bogus. But, as we agree – enough of that. Toad blusters that Catholics are (among other things) looking “ludicrous” and “idiotic” to publish the above article. The evidence purported by people who had absolutely no need to lie, some whose lives changed completely through their experiences, and whose claim is wholly in line with Catholic teaching on the Doctrine of Purgatory, is “mumbo-jumbo gibberish” in the eyes of wise, far-above-such-nonsense Toad ! He also insinuates that we are a whole bunch of liars. Ok, thanks Toad. But just perhaps, you might one day find out that he who laughs last…. etc. Liars? I insinuate no such thing, Kathleen. I am quite prepared, after many centuries on CP&S, to believe that people are capable of sincerely believing in the most extraordinary things. And why not? Some things are clearly extraordinary. It’s just that I find this particular article unusually unbelievable. Some obviously do not. Some people think The Beastie Boys are better than Beethoven. I don’t. Matter of taste, as much as anything. However, in this case the headline claiming “Scientific Proof,” and the picture in the second part of the article – showing what appears to be an oven glove dipped in tar, but is in fact (!) the hand print, we are told, of a sizzling soul in Purgatory – caused me to get a bit too vituperative. But, still – do souls in Purgatory actually have any hands at all? I rather thought they didn’t. Take a careful look at the “oven glove,” of which Toad wot. Then compare it to your very own hand. Rather a long thumb. eh? Reaches to the top of the first finger. Scientific marvel, really. Which is what it’s all about, apparently. Toad, you stated at 15:21 yesterday: “I don’t need to ask you to be truthful – you are Catholics”. insinuating (not actually saying) that Catholics lie. I have no idea whether people have “hands” in Purgatory. Considering the fact that their earthly bodies are buried or incinerated, one may suppose that only their souls are there. 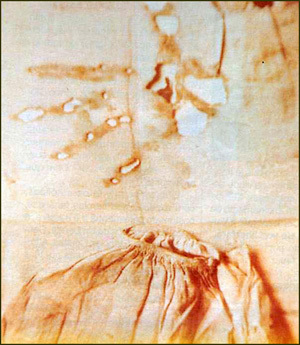 That these strange fingerprints and handprints appear from souls begging for prayers to alleviate their sufferings could certainly be called “mysterious”, but there are numerous things that are mysterious – or better said, that we cannot explain. The people who claimed such happenings of visitors from Purgatory in the article above, and in the follow-up link, had everything to lose (IOW, their immortal souls) if they had fabricated such tales. It does not seem to be in any way likely. Besides, there are so many stories from the saints and just ordinary people (even without these visible signs of suffering souls in Purgatory) that the evidence for its existence is overwhelming. We must pray for the Holy Souls. One day we might find ourselves there, desperate for the prayers of those still on Earth. Nobody is obliged to believe in the exhibits of the “Purgatory Museum”, and I do not know if these objects have ever undergone rigorous testing of any sort, or not. (GC also mentioned this in a comment above.) 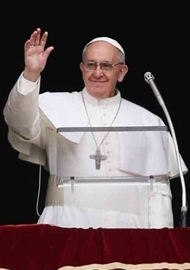 However, they have all undoubtedly been put together by people of impeccable honesty to show how necessary it is to pray for the Holy Souls, and to help those who feel a need “to see in order to believe”, to help them in their Faith journey, but especially for those who might doubt the doctrine of Purgatory. Kathleen, when I said “Catholics don’t lie,” I meant just that, and nothing more. You will not believe this, but it is true. Maybe I should qualify that a little – by saying I am sure Catholics do not lie when it comes to discussing matters of faith – in my experience for example, on CP&S. At least, I’ve never once been aware of it. Nor do I lie myself (not seriously – on CP&S, anyway.) What would be the point? I disagree, certainly, and usually, and regularly. But that’s something else entirely. Possibly – I don’t know – some Catholics lie when filling in their tax returns, or talking to their spouses, or when selling their cars. That is neither here nor there to me – on here. This whole Sooty Fingerprints of Purgatory business is so utterly trivial we ought both wash our hands of it..
My fault, entirely – for getting all absurdly bent out of shape about it in the first place. And, yes, it’s also high time I seriously quit CP&S. A fact I know better than anyone else on here. It is bad for my brain. But I am weak. And lazy. Well, let’s just call them inexplicable, then. And get on with sensible stuff. Like what’s for dinner. They want proof and when you give it to them, they won’t take it. A non-believer will be a non-believer until the Lord manifests Himself unto them. Please don’t wait until the devil himself helps you believe in the power of God the Almighty. Admittedly, Toad, calling it “scientific proof” makes one wonder if the author was not a simpleton. No scientifically minded person I know would consider this scientific proof. But otherwise its a nice little story for people who need such stories to bolster their faith, and I have no problem with that. I don’t doubt the supernatural in everyday life. Indeed it is more real to me than the natural at times. The credibility of such stories, like other ordinary stories, depends on the veracity of the witnesses. Not really “proof” here for anyone who needs it. The frightful things Toad used to say way back then – and seemed to get away with! Thank heavens the Moderators have got him securely chained down now. The Bible doesn’t talk about purgatory and if there were such a place it would tell that Christ dying on the cross was not sufficient and that we need to do something to gain salvation. ad Elmer: “Now I rejoice in my sufferings for your sake, and in my flesh I do my share on behalf of His body, which is the church, in filling up what is lacking in Christ’s afflictions.” Col 1:24 Protestants are completely stumped by this text. But Catholics understand this to mean that Christ’s suffering, though entirely sufficient, needs our cooperation in order to be efficient in each particular soul. Not because of some defect in Christ’s sacrifice, but rather because He wills to have our free and loving response. Catholics have a whole “theology of suffering” which makes sense of a lot, and I encourage you to delve into it that you may come to know Christ’s will for yourself better. To all you skeptics out there, I’ll take the word of St. Padre Pio, who has seen these poor souls himself. We tend to disbelieve what we do not understand. The skeptics will find out if this is all B.S. on the day they die. Unfortunately, by then, it may be too late. The choice is yours. Evidence that someone managed to make it look like handprints were burned into books, more like.